Camiguin is an island province of the Philippines located in the Bohol Sea, about 10 kilometres (6.2 mi) off the northern coast of Mindanao. It is politically part of the Northern Mindanao Region of the country and formerly a part of Misamis Oriental province. Camiguin is the second-smallest in the country both in population and land area after Batanes. Camiguin is known to be the island born of fire. Currently, there are four volcanoes: three inactive, leaving one active. This active volcano is considered to be the youngest one in the lineup. The fear of volcanic eruption doesn�t stop the tourists. Still, the island continues to receive countless visitors locally and internationally to witness the various beautiful spots that can be found within the island�s perimeter. 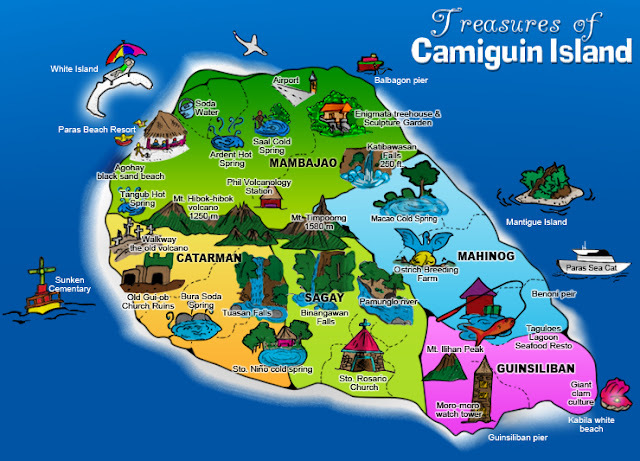 Camiguin is composed of five towns, namely, Mambajao � the capital town, Mahinog, Guinsiliban, Sagay and Catarman. The island plays host to seven volcanoes, including the still-active Mount Hibok-Hibok. According to the National Statistics Office, Camiguin has a total population of 74,232 persons, making the province the second smallest in the Philippines in terms of population. Among the Province's major products are coconut, cassava, banana, sweet potato, rice, corn, fruits, coffee and vegetables. Camiguin's volcanic soil has proved to be a fertile ground for planting various crops. At present, the Provincial government is looking into an agricultural program that would increase the cultivation of fruit trees and vegetables in Camiguin. The Province is also among the best abaca fiber producers in the country. Camiguin is proud of its natural resources, which include sulfur deposits, geothermal energy, agricultural lands and fishing grounds. 3/10/2014 "Weather in Camiguin most of the time is cloudy but do not be fooled, you will still definitely need sunblock upon arrival at their famous White beach"
From Manila, you can take direct flights of Philippine Airlines, Cebu Pacific, or Air Philippines to Cagayan de Oro City. Flying time approximately takes one hour and 20 minutes. From Cebu, Cagayan de Oro City is even nearer -- a mere 30 minutes away. One can also take the longer but infinitely more exciting ferry trips from the North Harbor aboard the ships of WG&A, Negros Navigation, and Sulpicio Lines. Depending on the routes (sometimes they stop over at certain ports such as that of Cebu City, Iloilo City or Bacolod City), a ferry trip to Cagayan de Oro City usually takes 28 to 36 hours. From the Cagayan de Oro City airport, you can take a cab to the bus terminal located at the Agora Market and get on a bus for Balingoan, a town 88 kilometers outside the city. At Balingoan, take a ferry bound for Camiguin Island approaching Camiguin by sea. The trip usually takes an hour before you reach Benoni Wharf of Mahinog, which is 17 kilometers from the capital town of Mambajao. You can also take a three-hour ferry ride from the Cagayan de Oro Ferry Terminal to Guinsiliban, also in Camiguin on board M/V Yuhum. History: Old Spanish documents indicate that the renowned explorers Ferdinand Magellan and Miguel L�pez de Legazpi landed in Camiguin in 1521 and 1565, respectively. The first Spanish settlement was established in 1598 in what is now Guinsiliban. Guinsiliban which comes from the old Kinamiguin word "Ginsil-ipan" which means "to look out for pirates from a watchtower" has an old Spanish watchtower where the Camiguinons kept watch for Moro pirates. Camiguin is well known among the ancient inhabitants of this country. The island's name was referred to as Camigui, Camiguing and Camiguenen by early Spanish and Portuguese chroniclers. The name Camiguin is derived from the native word "Kamagong", a species of the ebony tree that thrives near Lake Mainit in the province of Surigao del Norte, the region from which the earlier inhabitants of the islands, the Manobos, came. Kinamigin, the local language of Camiguin, is closely related to the Manobo language. Weather: There are two seasons, the wet season and the dry season. Based on temperature, the seven warmest months of the year are from March to October; the winter monsoon brings cooler air from November to February. May is the warmest month, and January, the coolest.